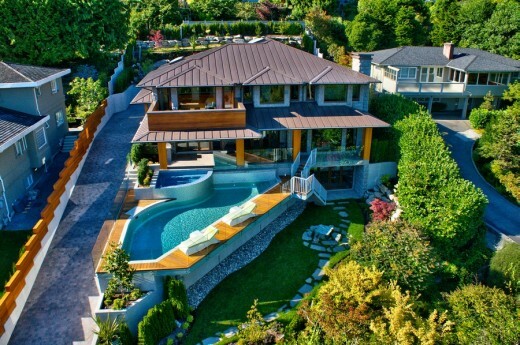 This spectacular residence is a vivid example of the West Coast style brought to its excellence. 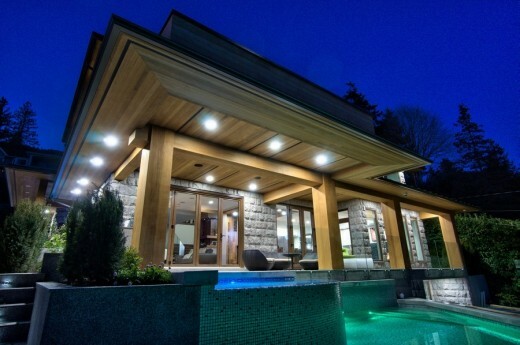 Beautiful natural granite envelopes the house exterior together with colossal cedar elements, integrates completely with the natural rock and secular cedar trees around the house. The curbs geometrics throughout the residence develop a central theme and mood: from the panoramic windows, to the elegant entrance with artistic glass, to the massive post-and-beam porch roof. Everything relates to one another and to the surroundings becoming a part of unified, interrelated composition. The house is positioned on the challenging rocky terrain, adjacent to the creek, in a way permitting to maximize the living areas and to save the space for a world‑class swimming pool. 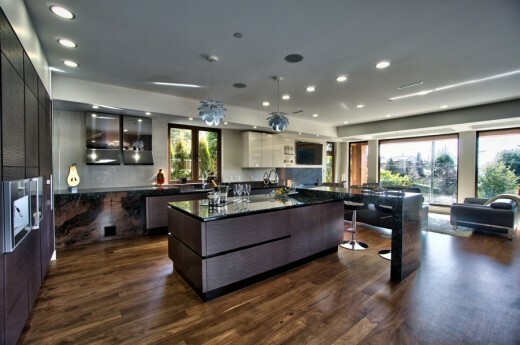 The residence is designed for a dynamic social lifestyle, and it is perfect for both entertaining and family needs, featuring a gorgeous living space with an open floor plan. The interior of the house meets its final goal: to address functionality and aesthetics. The main level includes a private office and an open living-dining space with an elegant kitchen for receptions and a separate working kitchen. The lower level includes a state-of-art 3D theatre, billiard, bar, steam room and wine cellar. The combination of floor to ceiling windows, skylights, beautiful views of the city and ocean create a unique atmosphere for rest and relaxation. The residence has an exceptional EnerGuide rating of 87, as assessed by independent certified energy advisors. The house features an air-to-liquid high efficiency heat pump and air conditioning system, modern appliances and LED lighting. The air leakage test’s results show that the home offers outstanding air leakage insulation and exceeds air tightness requirement for ENERGY STAR for New Homes® Certification.